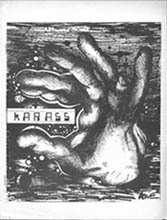 Karass (Ivey) - ZineWiki - the history and culture of zines, independent media and the small press. Karass is a science fiction fanzine by Stephen Ivey. Karass was published in Monroeville, Pennsylvania, U.S.A. The cover art was by Kevin Erwin. Linda Bushyager's Karass was preceded by a one-shot fanzine, also called Karass, written by Stephen Ivey, and published in Jan. 1971. The goal of that zine was "a fanzine dealing with the history and/or criticism of science fiction." The relationship between that zine and Bushyager's zine is unclear, but Ivey writes in that issue "Thanks are given to Linda Bushyager, without whose help this would not have happened." This page was last modified on 21 December 2017, at 20:09.